Often while discussing films we rank their importance with the alphabet. An A film is a mainstream, high dollar movie. A B movie is a low-budget commercial film that may have a quality story line and actors, but is less publicized. These films would be the bottom half of the double feature — sort of like the song on the 45 record that wasn’t the hit single. 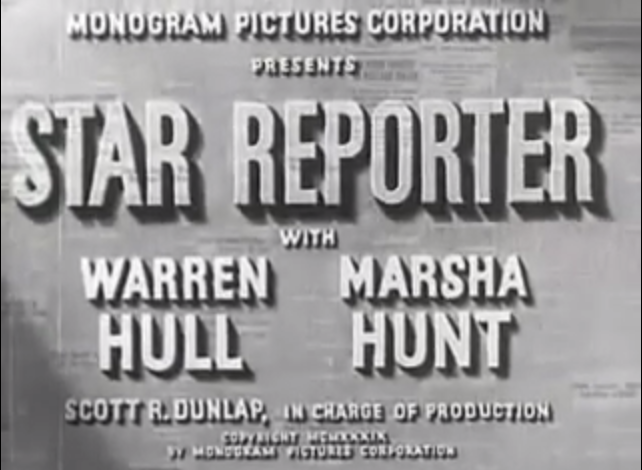 “Star Reporter” (1939) would most likely fall under the “B movie” category. Distributed by “poverty row” studio Monogram Pictures, this hour long film revolves around newspapers and crime. Reporter John Randolph, played by Warren Hull, works for the Star Tribune newspaper but is also a “star” on the job. Considered bright and brilliant, his father was the owner of the newspaper and was recently murdered. Randolph believes his father was killed because he had information that could bring down the “underworld” of the town. Randolph is also a big supporter of District Attorney William Burnette, played by Wallis Clark, and throws his support for the DA in each of his stories at the newspaper. 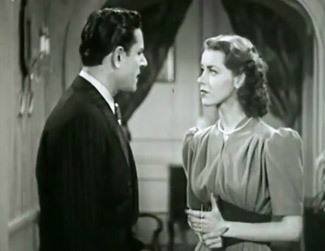 Randolph happens to be engaged to the DA’s daughter, Barbara, played by Marsha Hunt. But when a murder happens, secrets about Randolph and his mother Julia, played by Virginia Howell, are threatened to be dragged out. It turns out that the deceased newspaper owner was not Randolph’s biological father. Mrs. Randolph was once married to Charlie Bennett, who disappeared and was believed dead. Bennett has now reappeared as the murderer using the name Joe Draper, played by Morgan Wallice. 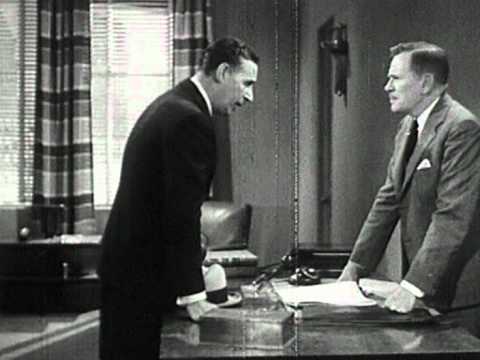 Lawyer Whitaker tries to bargain with the DA. Dirty lawyer Whitaker, played by Clay Clement, is defending Draper. Whitaker knows Mrs. Randolph’s secret and threatens to reveal it, if she and the DA do not cooperate and close the case. Draper already signed a confession with the DA, but it is stolen by a thief named Clipper, played by actor Paul Fix in a very small role. The DA decides not to prosecute to protect the Randolphs. John, not knowing the family secret, turns against his father-in-law-to-be. Now rather than backing the DA, he works to get him thrown out of office, which was Whitaker’s goal. For an hour long movie, this is an awfully complicated and mildly confusing plot. Unlike most newspaper films of the 1930s and 1940s, the majority of the film does not involve a reporter playing detective or getting in fights with gangsters. I was pleasantly surprised by this, until the end. At the end of the film Randolph is in the same house as the gangster/his biological father with a gun pointing at him. Though as a reporter, it’s not terribly accurate. I wasn’t surprised by this plot development. In my experience as a reporter, I have never gotten in fist fights with gangsters, but then maybe it was different in the 1930s. Reporter Randolph is engaged to the DA’s daughter, played by Marsha Hunt. I did like how some of the lines showed just how busy reporters are and how they frequently are on call or away from home. “After we’re married you can furnish the pressroom as living quarters. That way I can run in and see you between murders,” Randolph said to his new fiancée Barbara. “Our wedding guests were kept waiting because of a special edition,” Mrs. Randolph told Barbara. These lines made me chuckle because anyone in newspapers know the words day off, weekend or quiet evening are almost laughable. I discovered “Star Reporter” shortly after I started working at The Shelby Star in October 2012. Over the last two years of working at the newspaper, I felt a special connection to the title, because I was (Shelby) Star reporter Jessica Pickens. Now as I wrap up my last week at the newspaper, I felt it appropriate to finally review the film I’ve been meaning to write about for two years. Is “Star Reporter” a great movie? No. The biggest names in the film are Paul Fix, who later went on to be in several John Ford films, and Marsha Hunt. Both actors are in the film for less than 15 minutes. But it is mildly entertaining, especially if you are looking for a very brief film to watch. In a year that released “Gone with the Wind,” “Mr. Smith Goes to Washington” and “Wizard of Oz” –just to name a few of nearly 100 well received films- it is interesting to take a look at the B side of the year 1939. In an age now where we only concentrate the blockbusters, these little hour long films are equally important to explore. This entry was posted in 1939 and tagged 1939, Marsha Hunt, newspaper films, Star Reporter, Warren Hull by Jnpickens. Bookmark the permalink. Sounds a fun movie. I’m always amazed at how much plot there can be in a 60 minute movie. I love the B thrillers and wish we could get some box sets of the best. I guess your life as a reporter is a little less exciting than back then on the Hollywood sets.